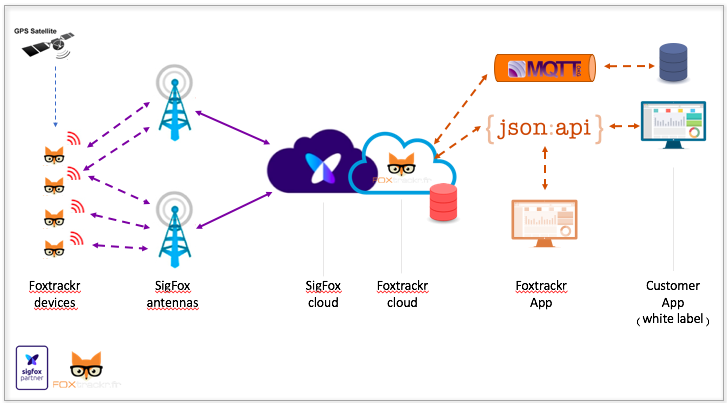 How does Foxtrackr works ? Foxtrackr are long time running GPS trackers using all the capabilities offered by the Sigfox technology. Our device are communicating low power and securely with the Sigfox network to report information like positioning and activities on regular basis. Sigfox network allows to communicate position more often than regular GPS trackers with a longer autonomy. The specificity of the network communication protect the devices against radio jamming and secure your assets. The positioning messages are transmitted over the air to the Sigfox Antennas covering most of the western Europe, part of Africa and growing all over the word. These messages are sent to the Sigfox cloud then routed to the Foxtrackr cloud where they are transformed and stored into readable data. Foxtrackr cloud is managing devices, communication protocol transparency, security, bidirectional communication. It is also delivering two kind of API. The pull API based on JSON standard REST communication allowing to request data on the fly the information you need. This API allows to quickly build dedicated frontend on the technology you want (angular.js, react.js, php, java …). The push API based on MQTT transporting JSON allows you to get in real time the information transmitted by the devices to store them in your own database. Foxtrackr is proposing a rich protocol with bi-directional communication for remote configuration. Our firmware is constantly evolving and our device can be reflashed to access the last functionalities. 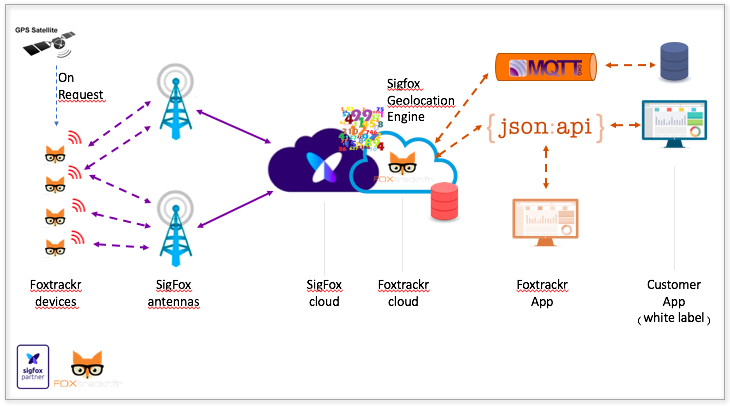 The Foxtrackr cloud API offers a stable interface whatever the device version is. As an option, our device is capable to support the Sigfox geolocation. This options allows to get larger autonomy by not using the GPS positioning solution for an approximate location. At any time Foxtrackr can be requested for a precise location based on GPS for fine tracking of the assets. Foxtrackr IP : it allows you to access Foxtrackr on your own hardware to include it on your own products. Foxtrackr CIRCUIT : the PCB family proposing different form factor and options and able to be directly integrated in your products. Foxtrackr DEVICES : this family of device proposing different cases and different powering solution you can use as a final product. Want to try it ? IngeniousThings Is an official partner of the SigFox network. Copyright © 2019 foxtrackr.com. Theme: Himalayas by ThemeGrill. Powered by WordPress.